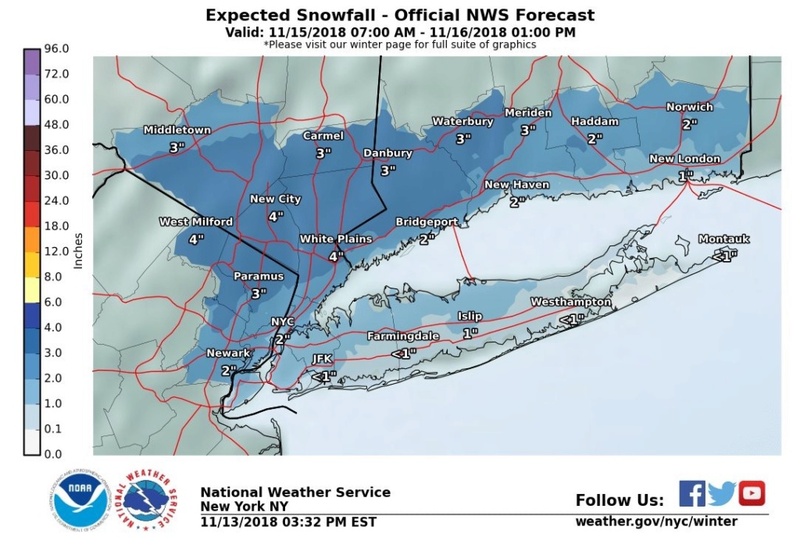 Upton's first snowfall map of the season! 12km nam is insane a high end motherazilla to Godzilla for a huge area am mobile. Will post later or someone else can. Both name show winds gusting to 40mph too. That's no good. 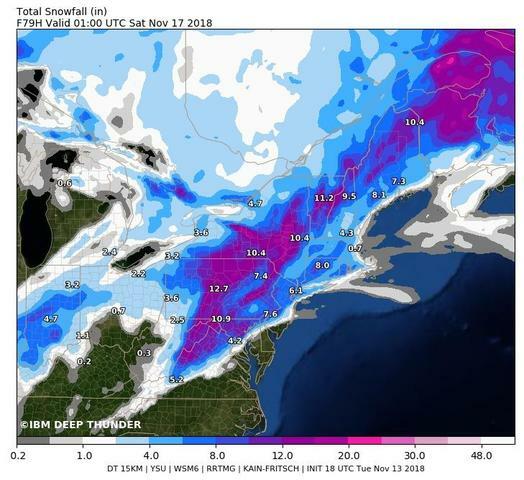 FIRST SNOW MAP OF THE YEAR. WINNER! I'm 100 percent ON BOARD, Syo! Oops. Forgot the edits for the Bronx and southern Westchester crew. I like you alot syo lol, 4-7 with even sleet I wil ltake it in a heartbeat! syosnow94 wrote: Oops. Forgot the edits for the Bronx and southern Westchester crew. 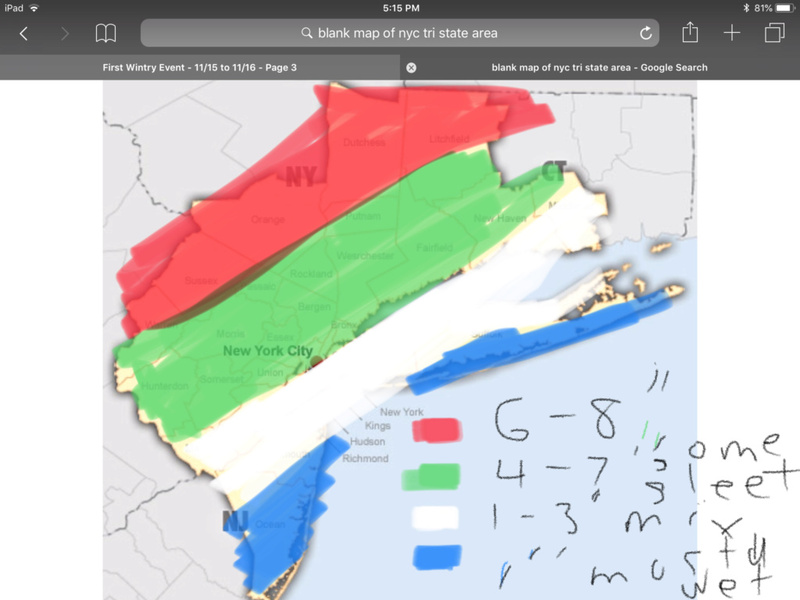 u dont know ur georaphy too well, you left southewrn WC in the green lol, and this isnt banter section, this is for real maps and I am guessing ur 1st one posted is what you think, some people who do not know out sense of humor may actually think everywhere in green except bronx will see 4-7, per your projection. Well NWS says 4 inches, and they are conservative. Yes prolly overdone big time its the NAM but if you look back each run has gotten colder and higher snow totals. As of now this storm seems to me to be a play that will contain multiple acts. Roughly I see most people seeing heavy snow early Thursday afternoon, going over to a pelting sleet for a time, then just steady cold rain Thursday evening. Then Thursday night the rain tapering to showers, picking up again near dawn, and possibly ending as a brief bit of heavy wet snow before pulling away Friday morning. The further north and west you go, the longer the frozen precip will hold strong so they stand the best chance of some of these enhanced totals you're seeing in some models (i.e. more than 4"). 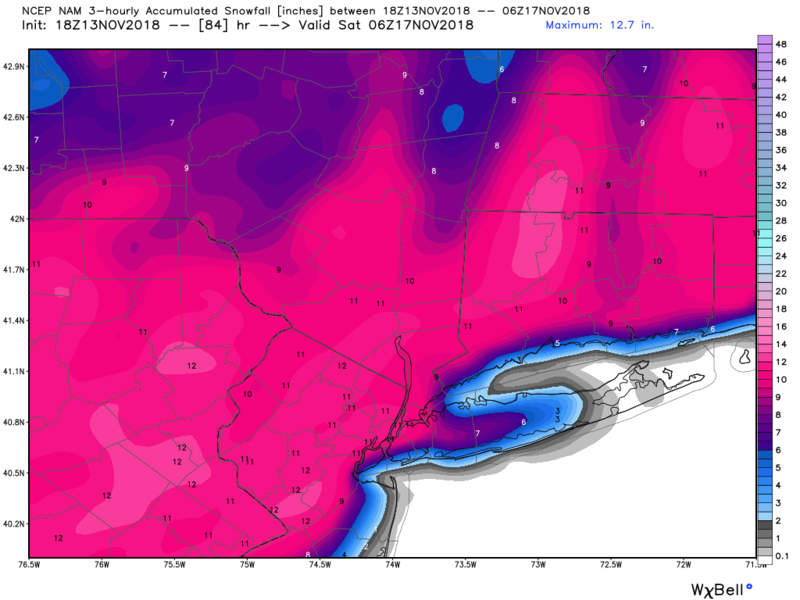 I think most people across Central/North NJ and NYC metro see about 1-3" before changeover to sleet and then rain. I'm still in the green, so I stand by my previous supportive post! So nothing really for the coast...man everyone on here is going to have a great storm. I don’t want to have a disappointment of a winter on the coast again....HATE RAIN!!! 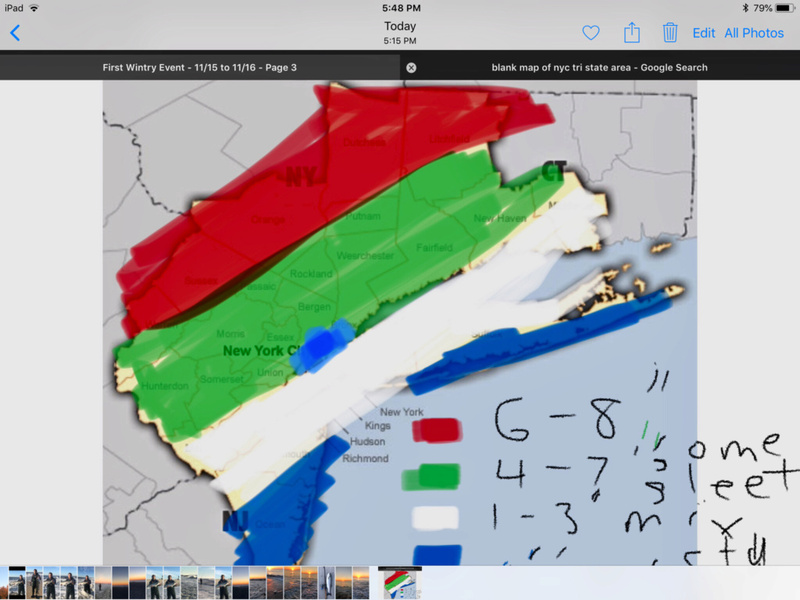 Smittyaj623 wrote: So nothing really for the coast...man everyone on here is going to have a great storm. I don’t want to have a disappointment of a winter on the coast again....HATE RAIN!!! Complain in banter, its November what do you expect? This is NOT a precursor to the rest of the winter, IMO the coast will do well, its just way to early. And no many members on here are in the same boat. 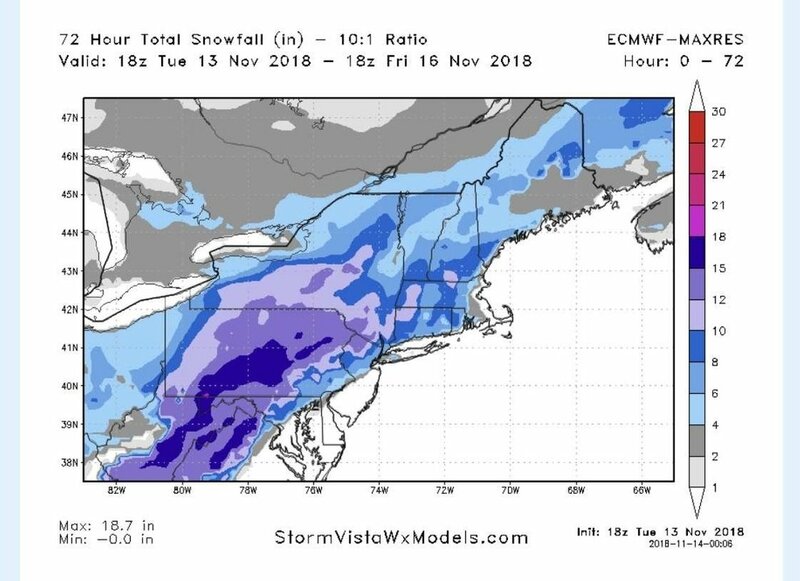 Here's the EURO snow map at 18Z. Hey skins what does the nam say?